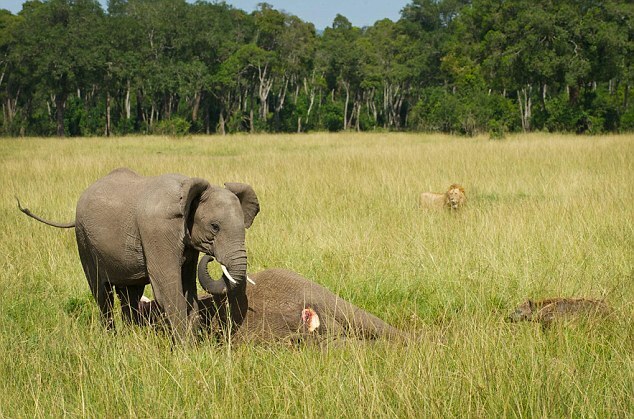 This is a heinous photo of a baby elephant who is mourning its dead mother. Is that a lion in the background? And a hyena on the right? This is hideous. And this incredibly intelligent and loving creature was slaughtered by mankind. This was not a kill for food (although the way that lion and hyena are looking, they probably may have had "fast food" for the day). This was a kill to satiate wretched excessively wealthy people who collect ivory. This photo breaks my heart. See article link below. Also visit my other elephant blog postings, by clicking here.